The Met Office has a good record of forecasting global CO2 levels and predicts that the average rise over 2019 will be 2.75 parts per million (ppm). That would put it among the highest annual rises in the 62 years since good records began. Only years with strong El Niño events, 1998 and 2016, are likely to be higher. The rise in 2016 was 3.39ppm. In the decade after the first measurement on the Hawaiian volcano Mauna Loa in 1956, annual rises were less than 0.9ppm per year. An El Niño event occurs when the tropical Pacific swings into a warm phase, causing many regions to have warmer and drier weather. Trees and plants are natural carbon sinks because they absorb CO2 as they grow, but this is reduced in El Niño years. “This year we expect these carbon sinks to be relatively weak, so the impact of record high human-caused emissions will be larger than last year,” said Betts. 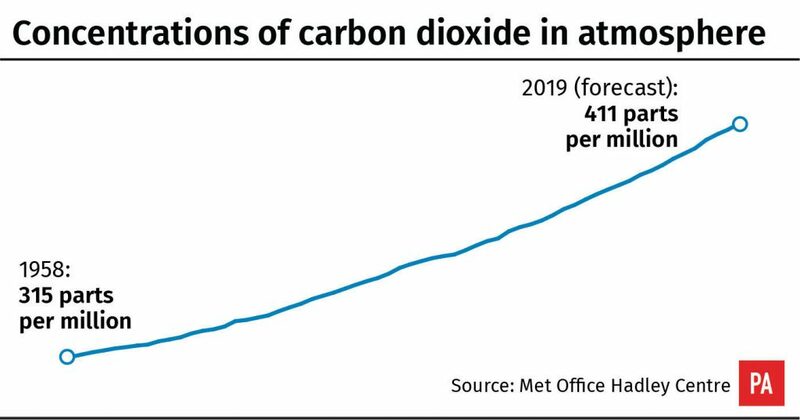 The Met Office forecasts an average CO2 level in 2019 of 411ppm. Monthly averages are expected to peak at 415ppm in May, before the growing season temporarily reduces levels to 408ppm in September, when CO2 will begin rising once again. The level of CO2 in the atmosphere before the industrial revolution sparked the large-scale burning of coal, oil and gas was 280ppm.